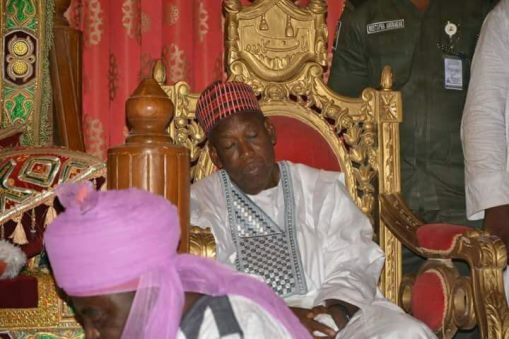 Kano State Governor Abdullahi Umar Ganduje has responded to his political opponents who had been accusing him of sleeping at public functions. 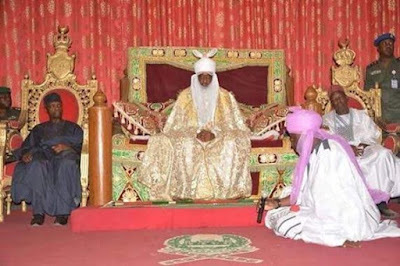 Speaking during an interactive session with labor unions as part of May Day celebration at the Government House, Kano, on Monday, he said that his critics could not differentiate between sleeping and pretending. Meanwhile see photos of the governor pretending to be asleep at various functions…. Reports going rounds claims that the Lagos State Government is set to prosecute Mercy Aigbe’s Husband, Lanre Gentry over Alleged Battery as the government have begun investigations into the matter. According to findings, Mercy, mother of 2, has dragged her husband, Lanre to the Lagos State Ministry of Women Affairs for investigation and prosecution over alleged battery and assault. A top official revealed that the case has been brought to the attention of the body; stressing it is a matter of urgency due to the mandate given to the ministry by Governor Akinwunmi Ambode to crack down on domestic violence especially against women. “Truely, the case is with us here. It was reported here by the victim herself, and because of the governor’s zero tolerance for domestic violence, we are as a matter of urgency investigating the whole drama. It is a good thing that it has also been brought to the public eye. We’re still very much on top of the matter and we’ll get it to its logical conclusion,” he said. Nigerian celebrities who secretly married their spouses: A wedding is commonly known is a marriage ceremony. Most wedding ceremonies involve an exchange of marriage vows by the couple, presentation of a gift (offering, ring(s), symbolic item, flowers, money), and a public proclamation of marriage by an authority figure. Some Nigerian celebrities have defied all odds by exchanging vows with their spouses away from pubic eye. We present you with 10 Nigerian celebrities who had secret weddings. On April 13, 2017, Woli Arole posted a photo of himself in a well tailored Agbada and captioned it, ‘Taken’ while his friends and colleagues shared the same photo, congratulating him. Anthony Joshua may have bagged £15m from his stunning knock out win over Wladimir Klitschkoon Saturday – but his first payment after the win was a humble laundry bill. Heavyweight champions of the world Joshua still takes his clothes to a laundry parlour in Golders Green, north London, near the flat he shares with his mum. And the 27-year-old has a £120 bill to pay off with a chunk of his huge purse and he hasn’t forgotten. Another Nollywood Marriage on the rocks: ‘Say no to promiscuous women.’ ‘Say no’ to domestic violence. Nollywood women looks to me they cannot sustain their marriages yet they give advises to married Nigerians. Latest in the long list of marriages that have ended now include Mercy Aigbe and her 50-year-old husband, Lanre Gentry. A source close to the family says ‘The marriage was destined to break’, ‘Mercy Aigbe has been promiscuous all through the marriage and this has caused a strain between them since the beginning. Unfortunately for the husband, the current economic downturn has taken a toll on his business and he is not as buoyant as he used to be few years ago. According to our well placed source, ‘The man has a hotel where Lagos-based actors and actresses use to shoot their movies, but the business was mismanaged and nobody goes there anymore. Sources said her husband’s latest fling with a very close associate of hers. Opemititi, who, was very close to Mercy broke the caramel’s back. Mercy had trusted her so much because of the secrets they both shared it is was shocking to her that this person could betray her by sleeping with her husband. Consequently, she cut Opemititi off from her in the last one month and decided to deal it with her hubby. Several fights occurred with the couple due to this fling. On this faithful day, Gentry asked Aigbe to cook a special meal for him and his friends. She refused to do so and her husband pounced on her as he had reportedly done in the past. For Mercy, that was one beating too many and she began divorce proceedings when she was strong enough to leave a private hospital where she had been receiving treatment. With all the big show off on social media of endlessly in love with each other, it shows us that what you see on social media is not always the truth. The fakes, lies, infidelities, promiscuity continues to be the consistent trend in Nollywood marriages. A customer forget the sum of $10,000 at UBA bank while security man found it and returned it. Mr. Ibrahim Ogbanago is unique. He is a gem, a true Nigeria. He made Nigeria proud. The late diva battled for years to save her brother from the powerful addiction of hard drugs, sources confided. But with Whitney gone, 59-year-old Gary barely resembles the athletic NBA star he once was — and it’s clear the overdose deaths of Whitney and her daughter, Bobbi Kristina, haven’t spurred him to kick his own drug habit. “Yeah, that’s Gary. The whole family is a bunch of dope heads,” a snitch spilled to Mr. Obnoxious. According to eyewitnesses, Gary was as high as a kite as he sat in his parked car — immobile and barely breathing with his foot on the brake as the engine raced — on the afternoon of Feb. 22 outside a notorious drug den in Atlanta, Ga. It was 11 days after the fifth anniversary of Whitney’s passing. “It’s a well-known drug house. There’s a lot of traffic going in and out of that dead-end street so it’s obvious,” a regular visitor to the dealer’s home told Radar. “The guy sells pills, all kinds of pills – pain pills, pills for anxiety, Roxy, cocaine, weed, and heroin. “Gary bought heroin, and he’s bought it before. I saw him give the dealer $200. After he handed over the $200, Gary went into the bathroom. But they told him he couldn’t do it here, so he went out to his car. Four hours later he was still in his car, passed out. Gary is married to Pat Houston, who was Whitney’s closest friend and manager. He toured as a background singer for Whitney, but he’s been struggling with hard drugs for decades. In 1996, North Carolina cops busted him with a crack pipe and five bags of crack cocaine after he bolted from a routine checkpoint. But cancer returned in 2012, and his drug use once again threatens his health.